The 2018 Maxima is the full-size sedan that you never knew you needed until now.Loaded with great features and intelligent tech, this fun-to-drive sedan delivers everything you've ever wanted in a full-sized sedan at an affordable price. Test-drive it today and you'll see just why this full-size sedan is a better option than top competitors like the Toyota Avalon, the Acura TLX and even the Lexus ES 350! The 2018 Nissan Maxima gives you more power and more fun! Drive one today and you'll see how easily the 2018 Maxima leaves its top competitors in the dust, with up to 300 hp and up to 261 of torque @4,400 rpm.That's more power than the Lexus ES 350, Toyota Avalon, and the Acura TLX! Not only is it powerful, it's also fuel-efficient too!With a combined EPA-estimated fuel-economy of 25 MPG, you'll have fun passing gas stations on the streets of Orland Park and the highways of Illinois. As Nissan's biggest sedan, it's no surprise that the Maxima is as spacious inside as it is stylish on the outside. Even when matched up to to luxury competitors like the Lexus ES 350, the Nissan Maxima still delivers more front legroom and headroom giving you a spacious, more comfortable drive. 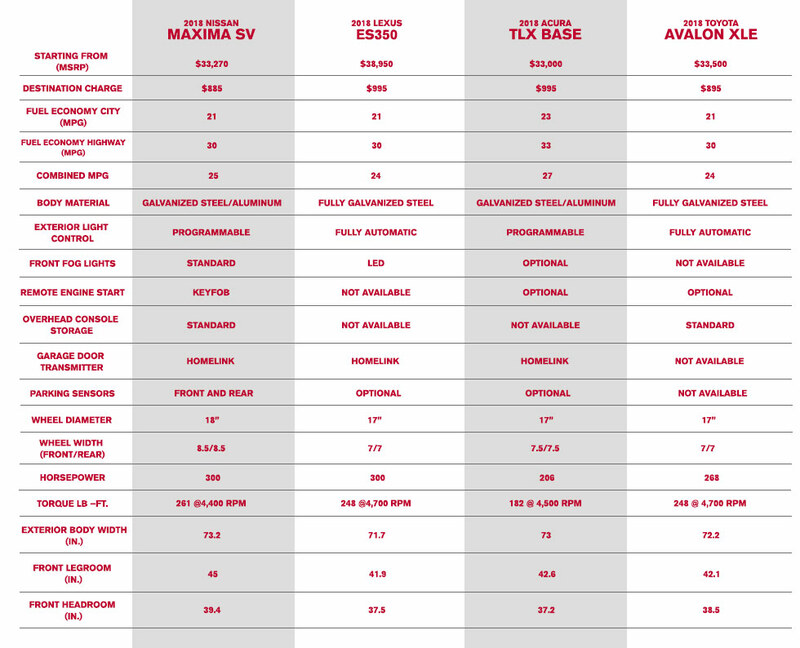 It also beats out other competitors like the Toyota Avalon and the Acura TLX in this category. Drive with added confidence behind the wheel of the new 2018 Maxima knowing Nissan's full-size sedan was designed with your safety in mind. With standard and available features like Forward Emergency Braking, Blind Spot Warning and Rear Cross Traffic Alert, the Nissan Maxima delivers a drive guarded by next-generation safety features. The 2018 Maxima also offers Vehicle Dynamic Control with Traction Control, Intelligent Forward Collision Warning, Automatic Emergency Braking, six standard air bags, a tire pressure monitoring system and a rearview monitor. Why settle for a full-sized sedan with less features, less space and less power? Get behind the wheel of the full-sized sedan that delivers more for less today at Zeigler Nissan of Orland Park.Visit us today and test-drive the new 2018 Nissan Maxima.